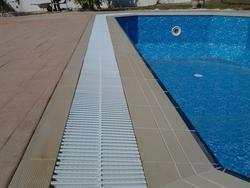 Made of PVC, this channel and grate system offers good open space for water flow. All grates are completely modular and interlocking. Swimming Pool Overflow Gratings in injection moulding Polypropylene with anti slip surface and chemical resistant. Central interlocking type to run along any shape of Swimming pool. Available from 200 mm width to 450 mm width. Our reputed entity is engaged in supplying Pool Channel. We are amongst the most reputed names in the industry, offering Pool Channel. 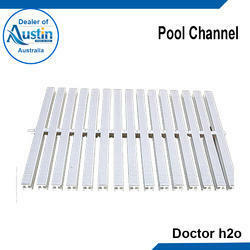 We are a top notch supplier of Pool Channel. We are engaged in offering Pool Channel. From our wide consignment, we are engaged in supplying Pool Channel. We are a top-notch organization, engaged in providing Pool Channel. In order to meet excellent quality standards, we are supplying Pool Channel.